Rocket Race is a complete Victorian steampunk card game being funded through Kickstarter by Triple Ace Games. A light-hearted and fun, non-collectible card game of eccentric Victorian scientists trying to construct a moon rocket! Glory and medals, naturally! I wish I could say exactly why “steampunk rocket building” was chosen as the focus for our first card game. One day I’ll think ahead and keep a diary of such things for posterity. The last few Christmases have been steampunk related in our house, as my wife has become a big fan of the genre and I’ve bought her quite a few books. Anyway, building a steampunk rocket appeared in my brain and demanded attention. Our Leagues of Adventure RPG was the main influence. We already had Leagues who wanted to explore the Moon, a place we’d touched on in one of the Globetrotters’ Guides expansions, and I’d designed plenty of weird science gadgets ideal for space flight. Rocket Race didn’t need much research. 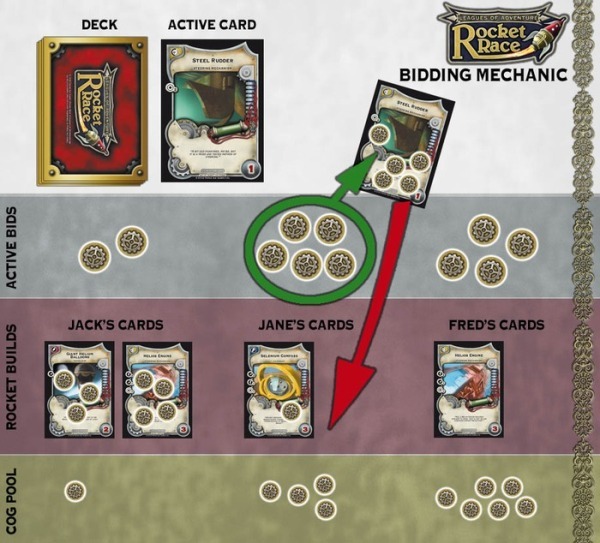 I read The First Men in the Moon and watched Jules Verne’s Rocket to the Moon, but only to get me in the right frame of mind – Rocket Race uses plenty of steampunk staples, but it’s a game from the imagination. It’s most definitely steampunk inspired – gears and cogs and rivets. It was important the artists captured the fun part of the game – this isn’t just a game about crazy rocket design. A game is what you make it, but all the playtest sessions have involved loud laughing, fierce competition, and praying to the gods of gaming our rocket makes the trip to the Moon. And since games take around 20 minutes, it doesn’t matter if you lose – just start a new game! Well there are many steampunk-themed games, but we hope that Rocket Race takes a lighthearted look at the theme. I can’t recall a game where you build a rocket, but I suppose you could draw comparisons with trick-taking card games, i.e. getting the rocket cards together is like getting a trick. The other mechanics I’ve not seen before – however that does not mean someone out there hasn’t had similar ideas! The essential steps at my end of the project are Basic Idea, Design Rules, Playtest, and Repeat As Required. As for the specifics of each step, I don’t keep a record or diary, so why many things happened is lost. For instance, I can’t tell you why we ended up with rockets needing a Capsule, Propulsion, and Steering, though that is kind of the basics of any real world rocket. Once I’d settled on the basic rules of steampunk rocket building (needing a Capsule, Propulsion, and Steering, plus Accessories), it was just a case of finding suitable names. Leagues of Adventure provided plenty of Component ideas, but there were still large gaps. Rather than relying on science and logic, I opted for things a mad inventor might try and use and that might be funny. That’s how we ended up with a volcanic eruption Propulsion System and Steering provided by 100 hungry mice leaning toward the Moon (it being made of cheese, naturally). We designed Rocket Race to be a simple, quick, low cost game, so we won’t be flooding the market with a stream of expansions. We’ve got three 10-card expansion sets as stretch goals in the Kickstarter and we’re working on Rocket Raiders, which adds steampunk weaponry to the game.